Arcos de la Frontera, Cadiz - Andalusia, Spain. This is a town celebrated in literature, that sits astride history and legend and is the cradle and refuge of writers and poets, such as Jesus de la Cuevas, who described it "like a cloud that had suddenly fallen onto the cliff, dazed by the whiteness against the sky"
The town is in the northeast of the province of Cadiz and is one of the most spectacular high locations at the top of and down a side of a cliff, on the right hand bank of the river Guadalete. The town sits between 50m above the river at its lowest part and 195m at the base of the castle. It's the starting place for a tour of the Pueblos Blancos (white villages). One's first impression is of a row of whitewashed houses sprinkled with imposing monuments which rise towards an impressive rose tinted gorge. 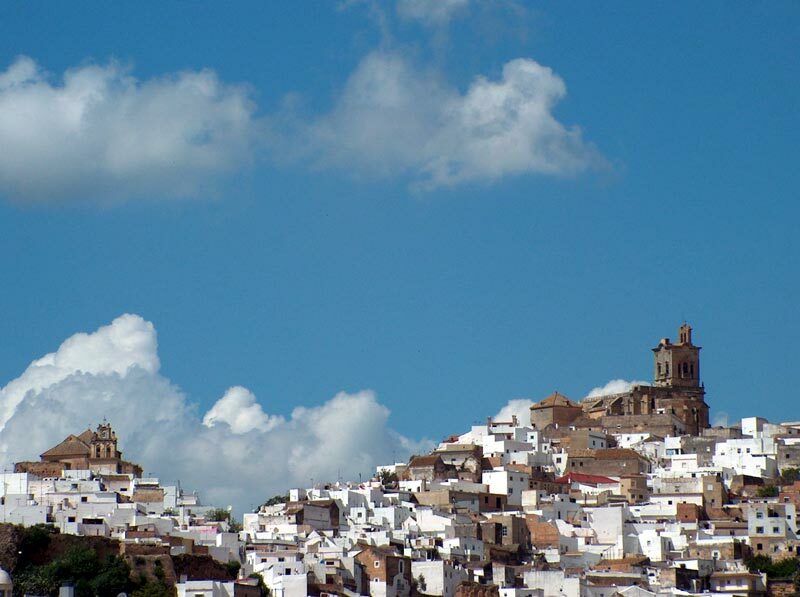 Arcos is typical of the white villages and is well worth a leisurely visit. Its best to leave your car at the bottom of the cliff and make the trip on foot. The surrounding has almost unlimited countryside attractions, such as, hiking, mountain biking, horse riding as well as hang-gliding and para-gliding. While still within the outskirts of the town one finds oneself in the Paraje Natural de la Cola de Embalse de Arcos. A little further to the east you find Sierra de Grazalema natural park, a real jewel of the Province. The Lago de Arcos (Arcos Lake) is a good place for watersports, such as, rowing, dingly sailing, windsurfing and motor boating. Fishing enthusiasts have one of the best facilities and throughout the year there are many regional and national competitions. The most popular festivals are Carnavales(February), Semana Santa(Easter),Toro Aleluya(March), Belen Vivente(Christmas) and the Feria de San Miguel(September-October). 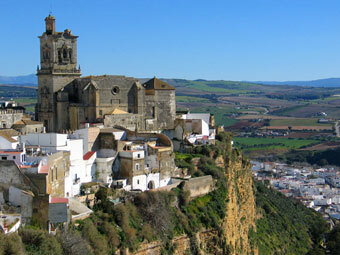 Arcos was settled by the Romans, Visigoths and Moors. It has one of the most charming ancient quarters in the whole of Spain. The whole of it was declared a National Historic Monument in 1962. The winding route of its streets reveal a dominant Arab influence which has been enriched by subsequent Christian periods. Most visitors are delighted by the many Baroque and Renaissance frontages which are decorated by coats-of-arms and splashes of floral decoration. Additionally, there are many historic buildings, of which the most important include:- the churches of Santa Maria (15th century)and San Pedro and the convent of Mercedarias. The main square of Arcos houses the Castillo de los Duques which was the residence of the Taifas Kings during the Moorish centuries. Next door is the Arco de Matrera , the only preserved town gate of the walled precinct.